Robert Victor Britten, LDS - Dentist. Attends on Fridays (K1916) . Mr Britten also appears to have a Friday clinic at No 13 Market Place. Why does he maintain two consulting rooms? R V Britten and his wife Edith live in Lowestoft and have a three-year old son, Edward Benjamin, who will become a world-renowned composer, conductor and pianist. 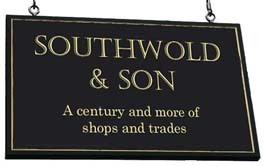 Jellicoe & Son - Home and Estate Agents. This year the business is sold (new owners?) but continues trading under the Jellicoe name. Flick & Son - Estate Agents take over the business and rebrand it. Alan Greening - Historic Building Architect. 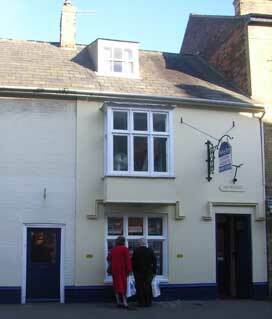 Occupies offices in the same building as Flick and Son. 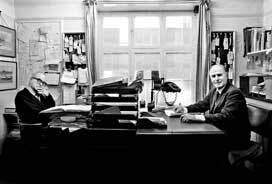 Brothers Tom and Paul Jellicoe in their office in their final trading years in the mid eighties.